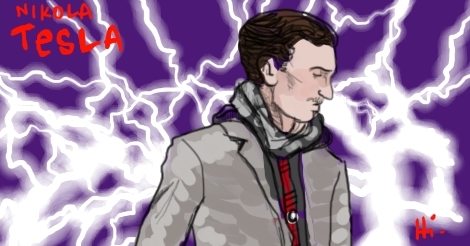 The sad life story of Nikola Tesla is one almost everyone knows. A brilliant genius mind too good for this world, his kind altruistic intentions were continually thwarted by jealous capitalists who were bloodthirsty cutthroat money making greedmonsters who would stop at nothing to create monopolies on inventions, THOMAS EDISON. I’M LOOKING AT YOU. Born on July 10, 1856, in modern day Croatia, Nikola emigrated to the United States in 1884 and continued inventing and being plagued by setbacks. He gave us alternating current electricity and Tesla Coils, among other things (I’m not writing a book report here — do your own research), so he wasn’t a long string of failures or anything. But the end of his life seemed to be a struggle with unpaid bills, relative obscurity, and dying all alone. If only he had used all of his futurist mind to invent a time machine instead of all of these other things that would probably have been eventually invented by someone else anyway! Then I could use the time machine to go back to tell him to not bother with living the life of an inventor, aside from the time machine, and that instead he and his amazing cheekbones could be an early male model. 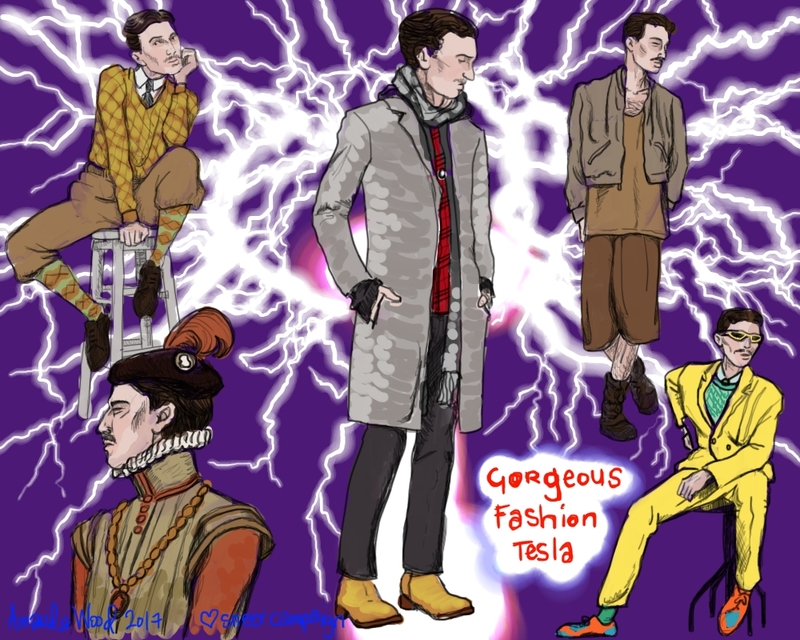 Mad Genius Male Model, skipping around the decades and working those outfits as only the painfully-thin-due-to-too-much-thinking can! Standing at 6’2″ and weighing 142lbs for dozens of years, clothes would have looked just right. Everyone would have taken notice. Notoriously fastidious about his appearance, and critical of the appearances of others, Tesla was a prime candidate for modeling, had it been a popular career at the time. He could have sported some casual wear of the early 1900s and pouted from atop a fashion stool, as depicted here. He could have also gone back to, say, the 1500s, and given the likes of popular Sir Francis Drake a run for his money by donning ruffles and busy patterns and exotic feathers, all while simpering for enthusiastic, elite crowds. Perhaps he would step foot onto any number of model runways of the 1980s, where slick shades would be the accessory of the day, a defense from all of those bright, bright colors. He would have done very well nowadays, where absurd mustaches seem to be fine for some reason. I predict, however, that if he would have found himself representing Yeezy Styles and being berated by Kanye, his proud scientific mind would have longed to invent that death ray.